Kick Axe, Regina's road warriors of heavy metal rock, plan to record their second album in July in Los Angeles, with a late August release date in mind. 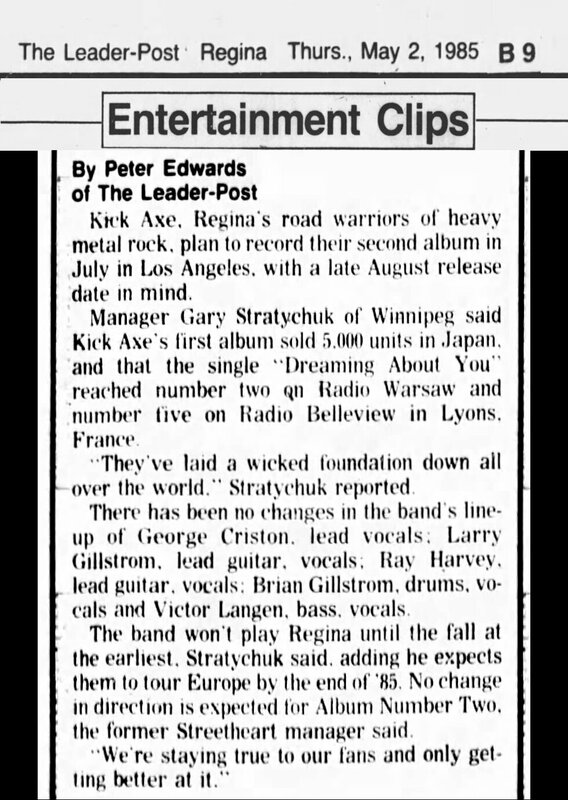 Manager Gary Stratychuk of Winnipeg said Kick Axe's first album sold 5,000 units in Japan and that the single "Dreaming About You" reached No. 2 on Radio Warsaw and No. 5 on Radio Belleview in Lyons, France. "They've laid a wicked foundation down all over the world," Stratychuk reported. There has been no changes in the band's line-up of George Criston, lead vocals; Larry Gillstrom, lead guitar, vocals; Ray Harvey, lead guitar, vocals; Brian Gillstrom, drums, vocals and Victor Langen, bass, vocals. The band won't play Regina until the fall at the earliest, Stratychuk said, adding he expects them to tour Europe by the end of '85. No change in direction is expected for Album Number Two, the former Streetheart manager said. "We're staying true to our fans and only getting better at it."